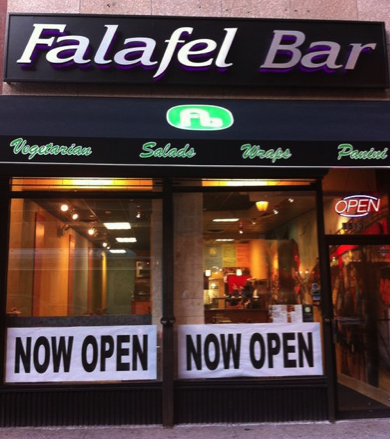 Luncher Mary just sent me a thorough run down of her experiences at the recently opened Falafel Bar at 1513 Chestnut and Zaffron Mediterranean Grill and Hummus Bar in the Liberty Place food court. Click through for the rest of her helpful report and who she thought was the winner. “I tried Falafel Bar first. On both visits, both at lunchtime, FB was almost empty, though the customers started lining up as I was leaving Friday. I ordered the Greek falafel sandwich (falafel, tomato/cucumber salad and tzatziki sauce) on the first visit to FB. The sandwich is a nice size for the price ($5.95). The ingredients were incredibly fresh, the falafel crispy and hot from the fryer. Although whole wheat pita was displayed on the menu it was not available, so I got the white pita – mistake, it was soft and gummy with almost no taste. After the sandwich I gave in to temptation and got a piece of baklava ($2.95) – really nice, the phyllo dough crispy on top and while not swimming in syrup certainly had enough to give it that sweetness everyone loves. 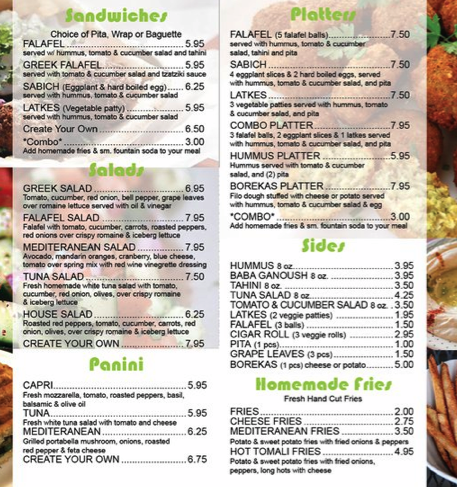 On my next visit there I ordered the combo platter, which for $7.95 consisted of three falafel balls, two thin slices of roasted eggplant, and one vegetable latkes (sic) with hummus, tomato/cucumber salad and pita (the white pita again, my fault as I should have learned my lesson the first time). The hummus and falafel were in separate compartments from the eggplant, latkes and tomato/cucumber salad, which were all resting on a bed of romaine lettuce. Again everything was fresh – the latkes soft and not greasy, the eggplant garlicky and nicely browned. Unfortunately, and this was the case with the sandwich on the last visit, there was no seasoning at all except for the tzatziki sauce on the sandwich. Not even a dusting of oregano or parsley as pictured on the menu. The tomato/cucumber salad especially cried out for some sort of light vinaigrette or even lemon juice. No other dressings or sauces are listed on the menu, but I would think that if the “default” dish has no dressing they should ask if you would like something on your salad. Then I went to the food court at The Shops at Liberty Place and checked out Zaffron Mediterranean Grill & Hummus Bar which just recently opened. The line here was about 6 or 8 deep but moved quickly. At Zaffron you have a choice of five “signature dishes” priced from $6 to $7.50, including three wraps, one salad and one rice dish, or you can make your own meal (wrap, salad or platter) from six different “fillings” such as chicken, steak or falafel. I ordered the falafel wrap to be similar to the falafel I ordered at FB the previous week. I had the choice of white or whole wheat wrap, so since I had finally learned my lesson I opted for the latter. The server slightly warmed the wrap in a press, then placed a small mound of romaine and three large falafel balls on the wrap, then passed it to the next server, who offered me any of a selection of additions. I chose the cucumber yogurt sauce and “Mediterranean salsa” (nearly a twin of FB’s diced cucumber/tomato salad, except this one had vinaigrette and herbs), plus a little hot sauce. Basically it was the default falafel wrap plus a little zing from the hot sauce. I also could have chosen from Kalamata olives, balsamic onion relish, or even mango chutney among a variety of other things but wanted to make as even a comparison as I could. The wrap also came with a side of eggplant caponata – sauteed eggplant seasoned with vinegar, spices and golden raisins. It sounds weird but it works, a cute little sweet-and-sour side with a slight hint of chili heat. This wrap was much more balanced than the FB sandwich, with the flavors and seasonings a good match. My only complaint, and it is a minor one, is that the falafel balls are too big, as sometimes when I took a bite all I got was falafel. Next time I will ask the server if he can spread out the falafel balls or even mash them a bit. Posted by Jamie at 10:28 am, March 9th, 2011 under Uncategorized. somebody get this guy a picture of the sandwiches. stat. Great writeup…gotta check out Zaffron’s flavors. For those asking for pics of sandwiches, check out my post of Falafel Bar…sandwich pics included. Sorry, don’t carry my camera around all the time, and I haven’t been back to Zaffron yet. I don’t think I’ll be going back to Falafel Bar. CE Phood’s pic pretty much tells the story of the sandwich there. 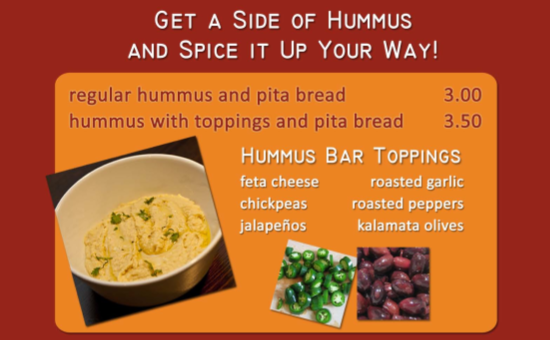 I have been back to Falafel Bar a few times since this post. I am happy to say they now have their act together as far as the salad seasonings. It really made the difference! Sabich! Not quite sure how Falafel Bar has escaped my notice thus far, but I know for sure I’m gonna have to head there for that soon now.